Oregon Gov. Kate Brown, Confederated Tribes of Grande Ronde Councilwoman Cheryle Kennedy, U.S. Reps. Earl Blumenauer and Suzanne Bonamici, Federal Transit Administration Acting Administrator Therese McMillan along with other elected officials and project partners today boarded the MAX Orange Line for the Inaugural Ride as part of TriMet’s Grand Opening Celebration. The Confederated Tribe of Grande Ronde lead the Inaugural Ride over Tilikum Crossing. 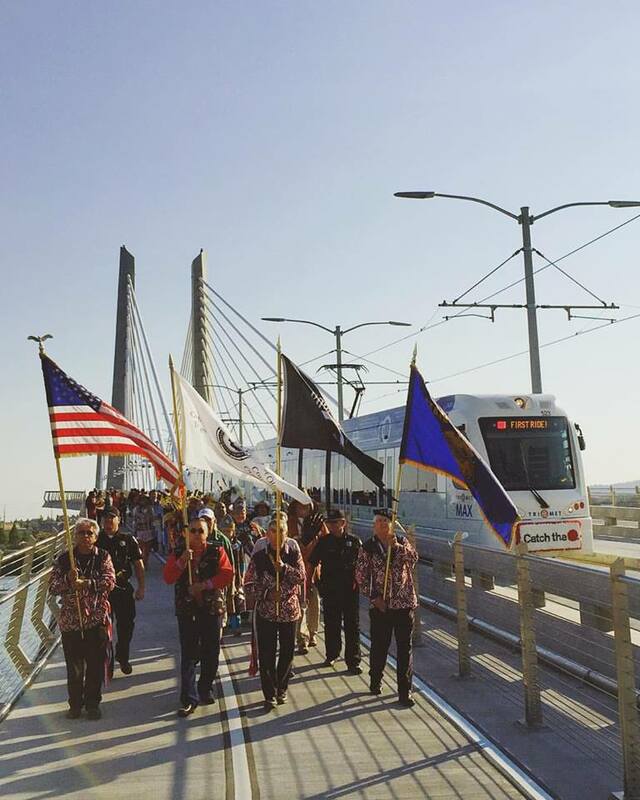 About 75 members of the Confederated Tribes of Grand Ronde led the Inaugural Ride train in a procession across Tilikum Crossing, Bridge of the People. The $1.49 billion Orange Line came in on time and under budget in the range of $48 million. To celebrate today’s Orange Line opening, all transit is free all day, including TriMet service, Portland Streetcar and Portland Aerial Tram. The 7.3-mile Orange Line extends from Portland State University, South Waterfront, across Tilikum Crossing to Southeast Portland, Milwaukie and north Clackamas County. The new line expands the MAX system to 60 miles and 97 stations. It adds another major transit option, especially with the metro area expected to add another 400,000 people in the next 20 years. The Orange Line is TriMet’s most sustainable light rail construction project. It has features such as an eco-track, stormwater treatment, eco-roofs, rooftop solar panels, habitat restoration and regenerative energy storage. The MAX Orange Line is officially open! About $65 million was invested in new and improved bicycle and pedestrian infrastructure, which includes 10.3 miles of new or improved sidewalks, 7.8 miles of new or improved bicycle facilities and 446 bike parking spaces with two secure Bike & Rides. The project also gave a boost to the local economy, creating more than 14,000 family-wage jobs. The added employment occurred at a time when the region needed them most during the Great Recession. One major infrastructure addition to Portland’s skyline is Tilikum Crossing—the only bridge of its kind in the U.S. carrying MAX light rail and Portland Streetcar trains, buses, bicyclists, pedestrians, but no private vehicles. Others dignitaries who participated in the grand-opening ceremony included the mayors of Portland and Milwaukie, Metro, Oregon Department of Transportation and Clackamas County Commission. Catch the Orange opening day events! Grand Opening celebrations funded by sponsors are being held at stations along the Orange Line. Visit CatchtheOrange.com for details. • The SE Park Ave Station is designed as a multi-modal center with both Park & Ride and Bike & Ride facilities and situated as a green gateway to the nearby Trolley Trail. • The Park & Ride building has a rooftop solar array, making it a “net zero” facility. The array provides enough energy to offset annual electricity usage for basic building functions, such as powering the elevator and lighting. • A rooftop garden helps manage stormwater runoff and improves air quality. All of the building’s stormwater runoff is captured and treated onsite, including the stormwater runoff from 2.5 acres of impervious surfaces surrounding the Park & Ride. • 68% of the garage and station area is set aside for restored habitat. • 102 bike parking spaces including a secure Bike & Ride facility. • Seven electric vehicle charging stations will be used by TriMet and PSU to research travel patterns such as EV/transit linkage and last mile trips. • Invasive plants were removed and native specifies planted to restore former habitats. • TriMet and Urban Green member Chips Janger secured a Nature in Neighborhoods grant from Metro. The $350,000 helped improve habitat around the station area. Along with ODOT’s Storm Retrofit Grant, it revived a riparian forest habitat along the southwest edge of the station area. The Oak Grove community also benefits from a new ecosystem-based stormwater treatment system that was installed to treat and manage stormwater flows from SE McLoughlin Blvd and the Trolley Trail. • The project team worked closely with North Clackamas County Park District to rebuild a segment of the Trolley Trail adjacent to the new MAX tracks, the station area and the Park & Ride. These enhancements include adding new plant species to improve aesthetics and diversity. The reconstruction required the removal of trees, but replaced with nearly four times the number of trees. Many of the removed trees were reused as milled wood, as firewood for Clackamas County seniors and low income residents, in habitat restoration, and for six sculptures of public art along the trail. Siemens has installed the first regenerative energy storage unit in the U.S. on the Orange Line. The technology allows for energy created during braking to be stored and then re-used in one of two forms, energy savings or voltage stabilization during peak demand times. 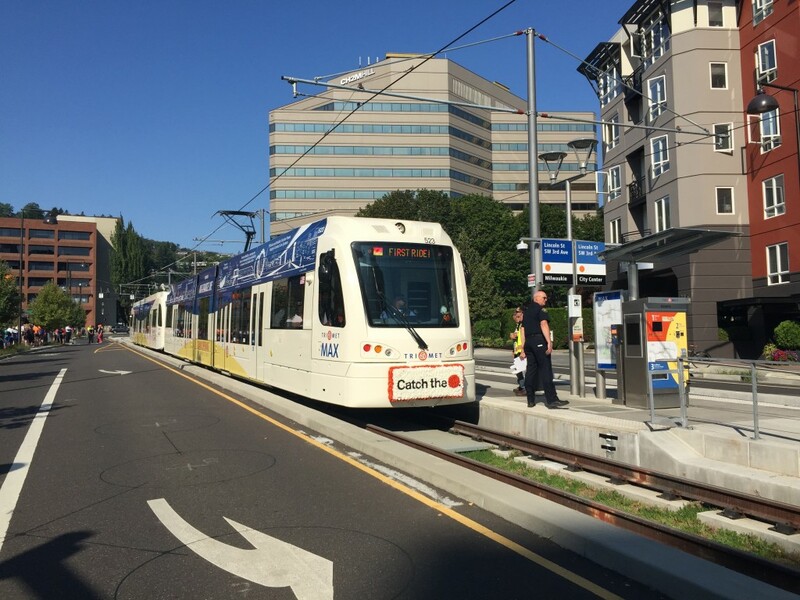 TriMet will utilize the system in voltage stabilization mode which will help avoid disruptions that can occur in mass transit operations if power drops below a certain level. Learn more about sustainability and the Orange Line. More than $65 million was invested in active transportation infrastructure along the MAX Orange Line corridor. This likely makes it the largest investment of its kind in the U.S. related to a light rail project. It includes10.3 miles of new and improved sidewalks and 7.8 miles of new and improved bike facilities. It means pedestrians, bicyclists and the community will have high-quality facilities and crossings, improved access to Orange Line stations, new bike connections and a significant increase in bike parking. Learn more about the active transportation improvements that came with the Orange Line. The Orange Line created more than 14,000 family-wage jobs at a time when we most needed them during the recession. A record $175 million in contracts were secured by small firms and those owned by women and people of color (Disadvantaged Business Enterprise-DBE). DBE contracts exceeded 25 percent ($175m) of all contracts awarded on the project ($669m). The project contracted with 564 private sector firms that included 134 DBE firms. Learn more about the people and companies involved in the building of the Orange Line. Tilikum Crossing is the only bridge of its kind in the U.S. carrying MAX light rail and Portland Streetcar trains, buses, bicyclists, pedestrians, but no private vehicles. Learn more about this unique bridge. communities has created more than just a light rail line. The 7.3-mile MAX Orange Line will improve transit along the corridor that extends from the terminus of the MAX Green and Yellow lines at Portland State University in Downtown Portland to South Waterfront, SE Portland, Milwaukie and North Clackamas County. • Two Park & Rides: 318 parking spaces at SE Tacoma St/Johnson Creek Station and 401 parking spaces at SE Park Ave Park & Ride Garage and 9 EV spaces with chargers.